I own so many great books about Los Angeles. My library is slowly pushing me out of my house, but these are some of my new favorites. Here are some of the best new L.A. books on my shelf. Come on a ride along with fanatical collectors and intense observers of the pop culture scene. This paperback journal offers an in-depth analysis of the painted walls at Café Frankenstein in Laguna Beach and a re-appreciation of teen idol turned San Fernando Valley cop Bobby Sherman. The Magic Castle founder has been an entertainer for almost 80 years. First as the youngest in a family of magicians, then as a radio and TV writer, and for the last five decades, at the helm of the Hollywood magic club. The dense little volume is packed with rare photos of old time showbiz folk yukkin’ it up and a lot of fun. 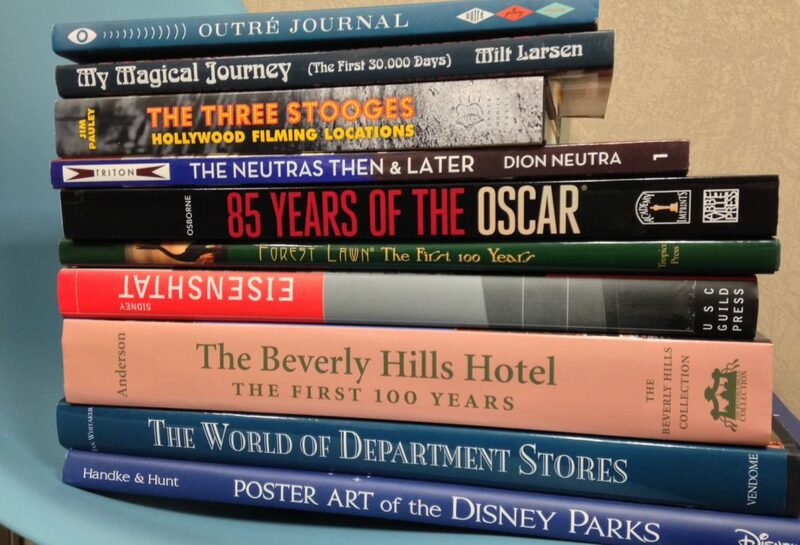 Several great books have been written in recent years on the places where the great silent comedians did their great work on the streets of L.A. Researchers have really been stepping it up and this one triangulates the exact spot where a trolley just missed Curly on Larchmont Blvd. It shows off Forest Lawn as a bucolic equine district, and makes you hunt for the checkered patch of Yucca Ave. sidewalk where Moe did some of his best bonks on the head. Richard Neutra’s son Dion has created a neat personal scrapbook-style volume that follows the evolution of some of the great homes designed by the iconic Neutra firm. Using snapshots, original correspondence, and those original Julius Shulman photos that made the houses famous around the world, the book feels like a private tour with someone who was there at the peak of the modern movement. The statistics of the great movie awards race are widely available, but this compilation by the TCM host has explainers for each nominee…especially the overshadowed science and technology awards. I didn’t know 20th Century Fox got an award in 1953 for inventing Cinemascope. Neat! Osborne includes a synopsis of the year that was putting the awards in context and includes some great on-set images from the Academy archives. Forest Lawn founder Hubert Eaton changed the cemetery industry so profoundly that we take his innovations for granted. The flat tombstones, the lavish grounds and gardens, and the grand architecture of the park are examined in this new centennial tribute. Another great entry from the USC Guild Press profiling graduates of the USC architecture school. Eisenshtat is probably best known for his Sinai Temple on Wilshire Boulevard. The lesser-known modern master created many other dynamic modern synagogues, but also banks, offices, and the space age Brandeis-Bardin House Of The Book in Simi Valley, which was so forward-looking that several Star Trek episodes were filmed there. In true Beverly Hills style, this volume is over the top. Clocking in at almost 400 pages and as heavy as a piece of furniture, the lavish look at Southern California’s most famous hotel includes all the usual suspects from old Hollywood; Elizabeth Taylor kissing Richard Burton, Esther Williams at the pool, and Robert Evans hitting on chicks. Anderson is a descendant of the original builders and includes impossibly rare paintings and early documents from Beverly Hills, whose development is indelibly tied to the hotel. The click and buy experience is so native to us that looking at pictures from the grand era of department stores really does seem like a visit to Atlantis. The glorious emporiums in this book are filled with carved wood, stained glass, and just boggle the mind. Los Angeles is mostly represented by our jazz age marvel, Bullocks Wilshire. The original designers of Disneyland were artists that had worked on the animated films. The stories of the rides played out like movies, and so it makes complete sense that much loving care would be paid to the poster that promoted each ride. This oversized homage displays the vivid graphics large enough to appreciate the visual punch they must have had even in the over stimulating environment of Disneyland. The backstories, and techniques used in their creation are fascinating, and I’m about this close to cutting out some of my favorites and framing them.